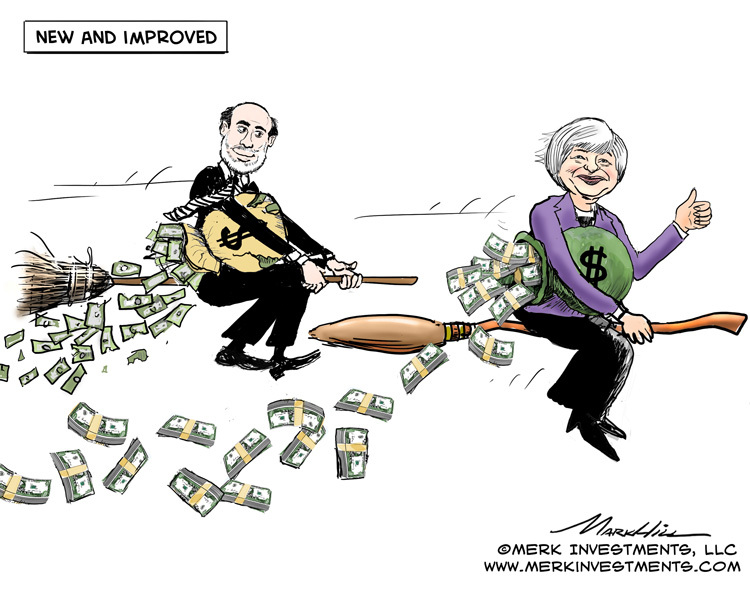 Merk Insights - Bernanke vs. Yellen: A Spooky Outlook? Bernanke vs. Yellen: A Spooky Outlook? Fed Chair nominee Janet Yellen will take over where her predecessor Ben Bernanke leaves off. Not just operationally, but also philosophically. To understand where the Fed and the U.S. dollar may be heading, we take a closer look at where Bernanke and Yellen are coming from. Bernanke has always considered himself a student of the Great Depression. He argued many times that one of the biggest mistakes made during the period was to raise interest rates too early. When faced with a credit bust, major deflationary forces are unleashed; in our assessment of Bernanke’s thinking, he believes the right policy response is to push back with accommodative monetary policy. But there’s more to it than low short-term rates. Downsize to homes they could afford. While this approach might be the best for long-term sustainable growth, it’s politically the most difficult one, as it embraces foreclosures and bankruptcy as a necessary evil. Pay down their debt. That’s more easily said than done in an era where real wages stagnate. Cross fingers in hopes the Federal Reserve would help to push up the prices, so fewer homeowners are under water. Each one of these policy moves is an escalation from the previous one. Most notably, the introduction of an employment target signals to the market that rates may not be raised until employment has picked up sufficiently. In theory, longer-term rates stay lower the longer investors expect short-term rates to stay low, the introduction of an employment target to keep mortgage rates and other longer-term interest rates low is akin to using a sledgehammer to hang a picture frame. At the end of this road then came the “taper” talk. Even though “tapering” merely referred to a pause in additional easing, markets, never shy of jumping to conclusions, immediately started to price in a complete unwinding of the nonstandard policy measures. Since then, Bernanke’s taper talk has been tapered. Bernanke’s strategy hasn’t been helped by the fact that communicating an employment target isn’t all that easy, given the array of metrics, such as the labor force participation rate, that help provide a picture of how healthy an economy truly is. The most important market based gauge, the relationship between short-term and long-term rates (the yield curve), is so manipulated by the Fed, that policy decisions are ever more “data dependent.” And to make matters worse, the government shutdown has made access to reliable data a scarce resource. With Bernanke out of ideas, out of steam, and out of data, it’s time for fresh blood. Yellen does not need to look back to the 1930s to arrive at her policy goal. It’s her starting point. In her speech accepting the nomination to succeed Bernanke, the first goal she stated was maximum employment. Starting with an employment target is really much more than a signal interest rates will stay lower for longer. Historically, the Fed’s realm is monetary policy, controlling levers such as interest rates and/or money supply. However, once the Fed started to buy mortgage-backed securities (MBS), it started allocating money to a specific sector of the economy. That’s supposed to be in the realm of Congress. When the Fed engages in fiscal policy, powerful dynamics may be unleashed, not least of which is political backlash. Yellen’s frame of reference, we believe focusing on an employment target suggests the Fed will be willing to cover for perceived shortfalls of fiscal policy. Of course, such “perceived shortfalls” are in the eyes of the beholder. Not being accountable to voters to make such decisions is, in our assessment, problematic. Needless to say, our elected officials appear to be at odds on how to run this economy. In fact, we would argue that our elected officials would only get their act together to engage in serious entitlement reform if pressured to do so. As voters appear to veer towards ever more populist politicians the one power that has shown effective in Europe to convince policy makers to engage in structural reform, is the power of the bond market. Once the bond market started to act up, governments in the Eurozone made tough choices to cut costly benefits that were no longer affordable. I’m hopeful we will engage in structural reform in the U.S. as well, but it may also take the pressure of the bond market to convince policy makers it’s time to act to make deficits sustainable. With the Fed pursuing extraordinary measures that pressure may not come as quickly as it might otherwise, allowing policy makers to squander time bickering over a discretionary budget. The discretionary budget may matter little in a few years, as the cost of serving the nation’s debt along with entitlement spending may entirely crowd out the discretionary budget. An employment target encourages social engineering. Yellen appears to be encouraged to pursue growth-oriented policies to help those that have not yet been able to participate in the economic growth of late. Never mind that substantial distortions might be caused in other segments of the economy, where those that have benefitted may be encouraged to engage in ever more speculative investments. Investors may want to consider diversifying out of the dollar to see how this unfolds. Unlike the Eurozone, the U.S. has a current account deficit. That means should the bond market impose reform, the greenback might be more vulnerable than the euro has ever been. And in case Yellen keeps a lid on yields, the valve may well be the dollar. Just look at Japan: what will happen should yields rise? Will the Bank of Japan stand by, allowing the government to drown in its debt? In the U.S., while debt levels aren’t as extreme as in Japan, the ultimate dynamics may be related should central banks be increasingly lured into financing government deficits. Please subscribe to Merk Insights and follow me on Twitter to learn how the “mania of policy makers” impact investors.